The days of traditional internal combustion engine (ICE) forklifts are not over, but perhaps the beginning of the end is upon us. New hydrogen powered forklifts provide quick refueling and pack plenty of power, according to a recent online article. The new lifts perform just as well – if not better – as ICE lifts. And once the new technology takes off, experts believe that the hydrogen technology will redefine the way companies transport goods and move freight. Thanks to the teamwork of Sandia National Laboratories and Hawaii Hydrogen Carriers (HHC), a new project plans to make zero-emission lifts more widespread in U.S. markets. 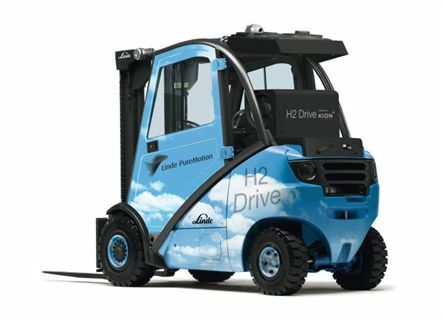 The major theme of the hydrogen lift project is quicker refueling – in fact, the low pressure system hopes to achieve four to five times faster refueling rates than a normal battery-powered forklift. This will give hydrogen lifts an advantage over the older models, and the stakes are pretty high. The “clean” forklift market projects to be a big part of the U.S. forklift market for 2014 and 2015, Keep in mind, the entire U.S. forklift market was nearly $33 billion in 2013, according to recent research. The SNL and HHC project was made possible by a grant from the Department of Energy’s Office of Energy Efficiency and Renewable Energy (EERE). Hydrogen forklifts are the next big thing, and CertifyMe.net is your dependable source for any type of forklift training – new models, vintage lifts, new instruction, re-certification and much more. We’re a single-source training provider for many well-known firms, including Jenny Craig, Harley-Davidson, Siemens and many more. In only 5 easy steps, you or your employees will enjoy the convenience of 24/7 online availability. Your schedule is our schedule! Certifyme.net features up-to-date OSHA-compliant forklift training for every type of business. Curious as to how our training can benefit your company? Just call (888) 699-4800 to speak with our customer service team, or visit our contact page for more information. And thanks for reading the CM blog. We appreciate your business!